Scotcheroos just came onto my radar within the last year or so, amazingly enough. How I could have somehow missed the memo on butterscotch-peanut butter Rice Krispy treats covered in chocolate-butterscotch is beyond me. 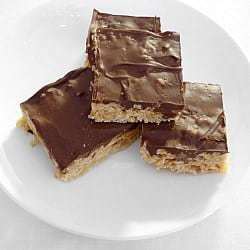 The previous sentence is a perfect description for these awesome bars – essentially a Rice Krispy treat minus the marshmallow with homemade butterscotch and peanut butter mixed in, then topped with a chocolate/butterscotch mixture. They are rich, buttery and delicious and encompass everything you loved about Rice Krispy treats as a kid. Plus, they can be made in less than 15 minutes which is perfect for a quick treat or when you need a potluck dessert in a hurry! 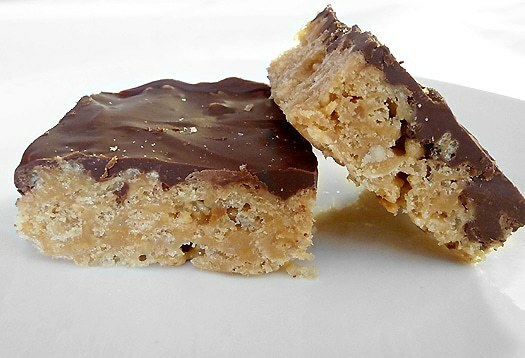 I took Jen’s lead (from How To: Simplify) and used crunchy peanut butter in these instead of creamy, which adds a great dimension to the bars – little bits of salty peanuts in each bite really balances the sweet smoothness of the butterscotch flavor. 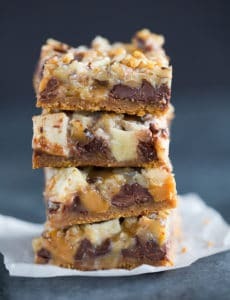 If you love chocolate, check out David Lebovitz’ Triple Chocolate Scotcheroos – he adds Nutella to the butterscotch/peanut butter mixture and uses Cocoa Krispies in place of regular Rice Krispies. Pure genius. 2. Melt the chocolate and butterscotch chips together either over a double boiler or in the microwave at 50% power in 30-second increments. Spread evenly over cereal mixture. Let sit until firm (or refrigerate for a faster setting time). These were great. My mom used to make these without the chocolate-butterscotch layer. And instead of putting them into a 9 x 13 pan, she’d form them into small balls. We had lost the name of these peanut butter cookies, so we named them Elmer’s Cookies, because they were sticky like Elmer’s glue. I enjoyed the simplicity of just patting the mixture into the pan, rather than forming all the cookies. And since I was adding the chocolate-butterscotch layer to the top, I sprinkled on some red, white and blue m&m’s on top of that since it was July 4th. Yum! I have made scotheroos so many times I could do it in my sleep. using a large pot I am able to do this all in 1 pan. I have modified it to what I think is the perfect bar. I use half brown sugar, & half white. add a pinch of salt to the syrup mix and cook about 1 minute after it gently boils. then stir in peanut butter and 1 T vanilla till melted. press into greased pan. sprinkle chips over bars… using half milk choc & half butterscotch chips. place under broiler ON LOW FOR JUST ABOUT 15 SECONDS or just til shiny. smooth with knife and cool. HOW DO I ADD THIS TO PINTERERST? Hi Joni, Right now you would use the Pin It button if you have it installed on your browser toolbar. Very soon I will have a “Pin It” button added to the bottom of each post so you can easily add your favorites right from the site. Am so loving your blog! Question re storage on these scotcheroos. Room temp or fridge? Thanks! Room temp! So glad you’re enjoying the site! We make these all the time using Special K, just like Amanda posted. My recipe calls for 1 & 1/2 C Jiff peanut butter and 6-7 C Special K cereal. 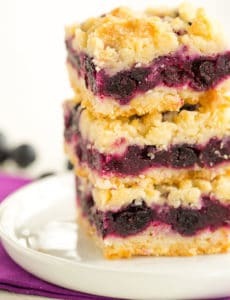 Take care not to over cook the sugar mixture or your bars will be hard. 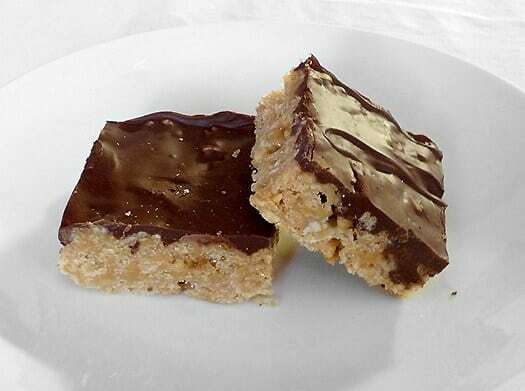 Try 1 1/2 cup peanut butter for the bar portion and 1 2/3 cup butterscotch chips in the icing. WOW what a difference it makes. I can’t make them fast enough for my family! These remind me of my childhood… They look great! I’ve never heard of these, but they sure look mouthwatering! Okay, I really need to make these. My kids would go crazy for them! These are my childhood! My cousin put together a family cookbook for my sister’s bridal shower and the recipe on page 1 is scotcheroos. At our last family reunion I think we ate 6 jelly roll pans full the first day. My mom made a batch or two daily to keep up with the demand! And I’m with you on the crunchy peanut butter – really interesting dimension with the crispy rice and decadent chocolatey topping. Great minds think alike…I just made these and posted them on my site the other day! Having never made or tried Scotcheroos in the past, I’m now in love with them! The flavor combination is absolutely delicious! Plus, they’re so easy to make…what’s not to love about that?! Oh my grandma used to make these for us all the time!! Yum thanks for the memories – – we’ll be making them this weekend! – 9 cups Special K cereal – buy an extra big box. Also, these are great if you put them in the freezer and then eat them slowly as they start to defrost. Like eating a frozen Snicker’s bar! Thank you for reminding me of these! My kids used to sell these at garage sales, back when they were young, sweet & wanted to help ;o) We’ll be making these this summer! glad you got to discover these! love them! I gasped when I saw the chocolate layer on these. Looks so good! I need a few baking projects up my sleeve while we ride out hurricane Alex. This will be perfect! I’m not familiar with scotcheroos myself, but it’s something I NEED to get to know! Seriously, you can’t go wrong with those ingredients, yums! I am drooling – this possibly could be the best combo every. How did I miss this memo? Oh yum! Can’t believe I have never heard of these. I feel so deprived. Must make double batch to catch up. My mom has made these wonderful treats forever! Instead of rice krispies, she uses Special K cereal! …….mmmmmmm…..perfect for the 4rth! My mom used to make these with the chocolate layer sandwiched between two layers of the krispies. They were very thick so I imagine it was double the krispie. I dare say the sandwiching makes them better. :-) Unfortunately I have a tree nut/peanut allergic kid, but I may have to try these with sunbutter. Thanks for the reminder. 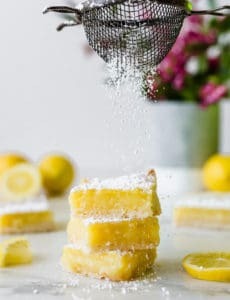 What a great dessert and pretty easy! I love rice krispie treats so they will be a great take on the old classic! My family LOVES these. Instead of using semisweet chips and butterscotch chips, I just use milk chocolate chips. My kids like it better. I also spread the rice krispie mixure in a jellyroll pan. No matter what size pan you use, these are so good!!! Mmmm, scotcheroos are soooo addictive!